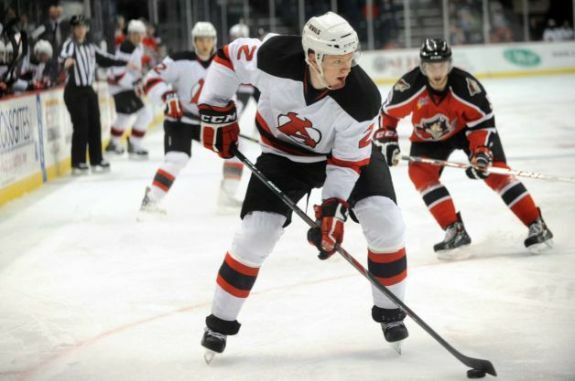 Regardless if he makes the New Jersey Devils out of training camp or not, one thing is certain about Seth Helgeson: he will be in the NHL one day soon. A fourth round pick in 2009 by New Jersey, the Faribault, Minnesota native has one thing that can’t be taught — size, and one that can — strength. He’s one of those ‘throwback’ defenseman; he’s tall (6’4”, 220 lbs), he’s nasty to play against, and he’s learning how to effectively use that size and strength to his advantage when defending the goalie’s crease. After a preseason win over the Philadelphia Flyers in New Jersey THW sat down with Seth Helgeson to discuss his chances of making the team, his college days as a Golden Gopher and making the transition from college to pro hockey among other things. The Hockey Writers: You’re still here at training camp, a week away from the start of the season, how good do you feel about your chances of making the team? Seth Helgeson: Obviously my confidence has raised (every day) since I’ve gotten here. Just being out on the ice with and learning from these guys has been great. Confidence is at an all-time high right now, but I’m just trying to go day-by-day and see how things go. THW: You played four years at the University of Minnesota, what was that experience like for you? SH: That was the best four years of my life to date, on and off the ice. It was just a great experience; I got a degree, made some great friendships along the way, I had a great coaching staff, a great group of guys I played with. We had some titles there, some WCHA titles, so it was just an all around good experience. SH: Business Marketing Education. It’s a (laughs), it’s a pretty broad major, but I had some great professors in there so it was a good time. THW: In 2009 you were drafted by the New Jersey Devils in the fourth round of the NHL Entry Draft, what are your memories of that day? SH: A great day for not just me but my family also. Leading up to the draft there was a lot of attention going on around me; when the day came it was just such a great feeling (to be drafted by an NHL team). I’m happy that I was drafted by a great organization. THW: Last season was your first full pro season; talk about it and how much fun was it to play in the playoffs? SH: The biggest thing for me was schedule, the amount of games, travel (riding buses)…that whole thing. There’s a big step from the amount of games played (40ish in college, almost 80 in AHL). Gaining confidence, being comfortable in the room, being on the ice in big games, stuff like that; with our leadership in Albany it was pretty easy for me, us rookies, to come in and get comfortable and help the team out any way we could. We had a good team, had a great year and it was great for my development. THW: What is it that you like about playing as a defensive defenseman? SH: The best feeling for me is keeping the puck out of our net; obviously that’s what we need to do to win games. Making that first pass (out of our zone), just give it to the forwards and let them score goals; and we’ll take care of defending it. I think I was thrown into the role when I went to college, growing up I was more of an offensive defenseman; in college I was playing alongside some really good guys. Just being back there and taking care of our own zone, keeping the puck out of the net is the main thing. I’ll do whatever I can to help us win back there to keep the puck out of our net. THW: Last weekend for the first time in a long time your alma mater beat Michigan at the Big House in college football to win the Little Brown Jug back. Did you watch the game, and have you razzed your two teammates who are former Wolverines (Mike Cammalleri, Jon Merrill)? SH: Just talking with Johnny Merrill I think the biggest thing is that it was surprising, going into The Big House; the odds were against Minnesota, but we played a great game — it was a little lopsided actually (smiles) in favor of the Gophers. I have a little bit of bragging rights but yeah it was fun to have a guy like Johnny at the hotel and we could talk about it. We’ll always have a little friendly competition there. But it’s good to have the Brown Jug though back in Minneapolis (grins); I’m happy for those guys and it’s just a good feeling of pride.